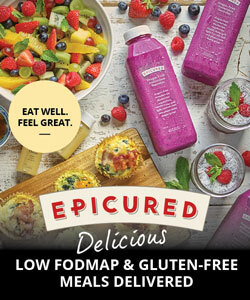 The Low FODMAP diet has helped improve my symptoms and I often eat gluten free products. Does this mean I may have a gluten sensitivity? It is a good idea to talk to your doctor so they can rule out coeliac disease. Coeliac disease is a common digestive condition where the gut has an adverse reaction to gluten. Recent studies have shown (see here) that a gluten sensitivity or intolerance may actually be because the person may be also be consuming many foods with low FODMAPs and are inadvertently on a low FODMAP diet. It is likely the improvements are due to the low FODMAP diet and the fact that gluten is often found in high FODMAP foods. What are the stages of the Low FODMAP diet? 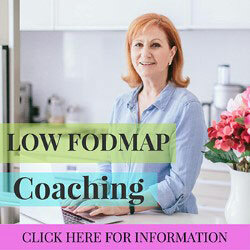 There is not a standardised time to the stages of the diet but often it is recommended to do an eight week trial of a strict low FODMAP diet under the supervision of a dietitian. After these eight weeks, under consultation with the dietitian, foods can be gradually introduced to allow foods that the individual can tolerate. Does everyone react the same to foods on the high FODMAP list? Should I avoid these foods forever? No, each individual can tolerate differing levels of FODMAPs and some foods may be perfectly fine to consume. The diet is a way to learn how much your body tolerates certain foods and the high FODMAP list offers guidance on the foods that are likely to cause problems. Under supervision with a dietitian you can work out after a period of time which foods you are able to tolerate – you will find you will not need to avoid every food on the high FODMAP list. In the long term it helps to introduce foods with FODMAPs that can be tolerated as they are high in prebiotics which help feed the good bacteria in your gut. What are the symptoms of FODMAP intolerance? When you eat a food that is high of FODMAPs and you have a sensitivity of FODMAP foods you may find that you get very bloated, you have get abdominal pain and often diarrhea or constipation occurs. These symptoms can happen almost immediately or more likely they can take a while to show up so it is often hard to work out what caused the problem. It helps to keep a FODMAP symptom diary to keep an eye on your intake and help work out what the trigger was. What does FODMAP mean and what does the FODMAP diet do? 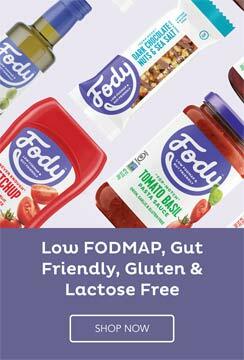 FODMAP stands for Fermentable, Oligo-saccharides, Di-saccharides, Mono-saccharides and Polyols. These are carbohydrates that have been shown the contribute to problems that many sufferers of IBS have. The diet is an elimination diet that helps these sufferers to identify what causes them problems and allows them to reduce their symptoms to a more manageable level. Can the diet cure me of IBS? No, the diet is a way to manage the symptoms of IBS and it cannot cure them entirely. I was recently put on the low FODMAP diet and I am still getting some symptoms like bloating. I am finding it hard to stick to the diet as the information is a little overwhelming. It might help to talk to your doctor or dietitian about your symptoms. It’s possible your symptoms will ease up after a few days but it would be best to check with them to be sure. Your dietitian will be able to offer advice on how to break down the diet for your own needs as they will go over common foods and meals you prepare and eat and offer alternatives to follow as well as providing tailor-made guidance. Can I drink tea or coffee? You have many options for tea and coffee. Black tea, white tea and various herbal teas are OK as long as they are made weak. The teas to avoid are chamomile tea, fennel tea and oolong tea. For coffees (regular or decaf), black espresso and espresso with lactose free milk or soy milk is OK. Instant coffee up to two heaped teaspoons is also OK. Espresso made with cows milk is considered high in FODMAPs. Should I avoid all fried foods including chips / fries? Food fried in a fryer should be avoided as there can be cross contamination of crumbs, onions etc otherwise chips and fries are OK.
Are there any recipes available that are low in FODMAPs? You can find a good selection of low FODMAP recipes on the Monash smartphone app which is available for iPhone and Android devices. You can also find recipes books on the right side of this site by the “recommended books” section. Why do food lists sometimes offer differing and conflicting information? The research for FODMAPs in foods is constantly ongoing and foods are tested regularly but not all foods can be tested. Sometimes foods have to be categorised based on educated assumptions which can cause differences in opinion. Serving sizes often can decide if a food is low in FODMAPs or high in FODMAPs so some lists can offer different information but both be accurate due to the serving size. Finally, as the research at Monash is ongoing there are times when foods are reclassified into a different category.